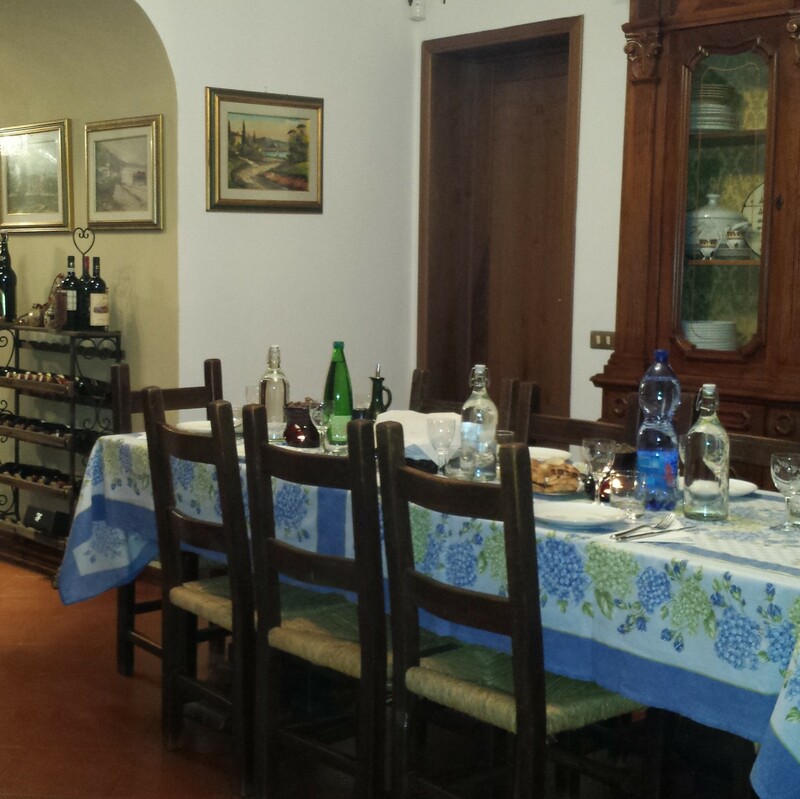 Come to dinner in a Florentine home! 474 visits so far. Thank you! Arrosto tenero di vitello is (tender) roasted beef. Pollo arosto is, simply put, roast chicken. We believe the photos speak for themselves; plus, who doesn’t like chicken, or even more so, who doesn’t like roast chicken? Tiramisu is a well-known Italian dessert. It is made using ladyfingers dipped in coffee and covered in mascarpone cheese, eggs and sugar. Our homemade tiramisu is even better, since we only use “km 0” products, bought from the local farmers markets. Pappa al pomodoro is a Tuscan meal typically prepared with fresh tomatoes, bread, olive oil, garlic, basil, and various other fresh ingredients. Just like the Ribollita, this dish also speaks of the Florentines’ ingenuity, since pappa al pomodoro was best known as a poor people’s meal. The rural origin of this first course is demonstrated by its ingredients: homemade Tuscan bread (unsalted), tomatoes, garlic, basil, extra virgin olive oil from Tuscany, salt and pepper. To get the real pappa al pomodoro, we always use unsalted Tuscan bread and extra virgin olive oil. Ribollita is a famous Tuscan soup, a potage made with bread, beans and vegetables – carrots, cabbage, silverbeet, cavolo nero, and onion. Ribollita means “reboiled” and speaks of the origins of this soup: back in the day, the Florentins would boil the leftover soup, added vegetables, beans and leftover bread to make the ribollita. However, it does not taste like any of the leftovers you have in mind. Crostini di fegatini is toast with home made pâté, cooked ground meat mixed with spices and minced into a spreadable paste. The meat we use to make this is chicken liver. Salumi misti means a mix of cured meats. In Tuscany, they are served as an antipasto – it means “before the meal” and is the traditional first course of a formal Italian meal. Finocchiona is a type of salami made of finely ground pork and fat, laced with fennel, and aged for a while. Finocchiona supposedly owes its origins to a thief at a fair near the town of Prato, who stole a fresh salami and hid it in a stand of wild fennel. When he returned for it, he found it had absorbed the aromas of its hiding place and had become fit for the Gods. Salame toscano is a Tuscan salami, a large sausage made with ground pork and cubes of fat that are seasoned with garlic, salt, and spices, and stuffed into the pig’s large intestine. It’s then seasoned for several months, at which point it’s ready for use, as either an antipasto or sandwich meat. Prosciutto crudo toscano is probably the most famous and the most appreciated European cured meat. Prosciutto is a dry-cured ham that is usually thinly sliced and served uncooked; this style is called prosciutto crudo in Italian and is different from cooked ham, which is called prosciutto cotto. Salame di Cinta senese. The Cinta Senese salami is a typical salami of the province of Siena, which is in fact made exclusively through the use of animals of pure race Cinta senese. This breed of pig is characterized by the very dark skin, the bristles all over its head and body, except for for a pink stripe (“cinta” means “belt”) on its anterior side which also covers its legs and hooves. Salame din Cinta senese is a sausage of large dimensions, which can vary between 0.5 and 2 kg, stuffed into animal intestines, with very intense tones in both taste and appearance.